Thank you very much for this helpful example. Most examples I saw are targeted around WCF/Silverlight. 1. Execute one async request so slow. 2. While async request execute, start a sync request. 3. The sync request finish and show information in the page. 4. The async request finish but can’t show information in the page. I think it’s necessary synchronize the context/threads, but I don’t know how do this in web forms. Do you do already something like that? I’m not sure that I understood your scenario. Basically as shown in the post, ASP.NET doesn’t seem to return till all async requests are done, so I’m not sure how the sync request finishes and shows the page where as the async request doesn’t (assuming that you’re using the async/await pattern, of course). 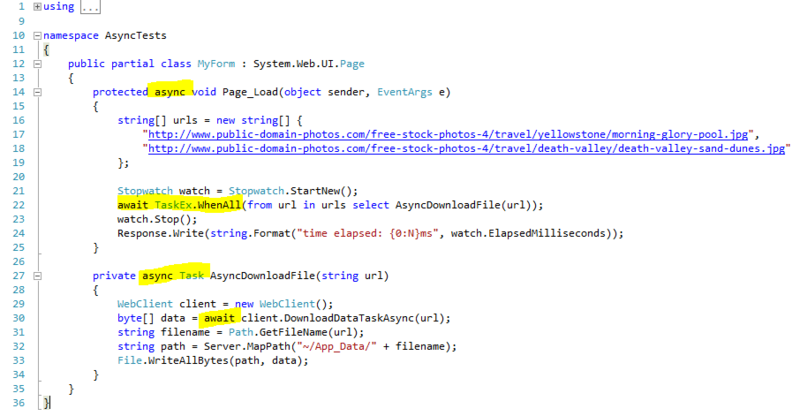 When I click at async button the process start and finish return at page with word “Async” inside my textbox. 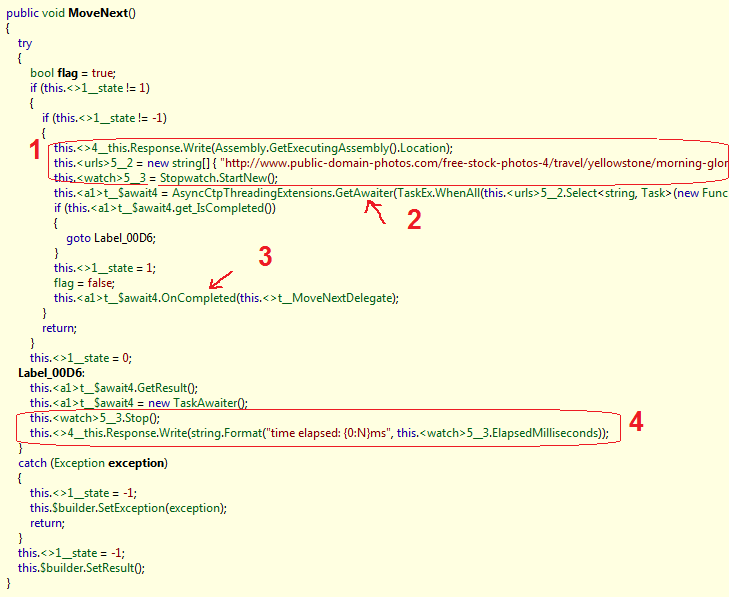 But if the async process is run and I click in sync button just the txtSync return completed. So the return always is the last request. 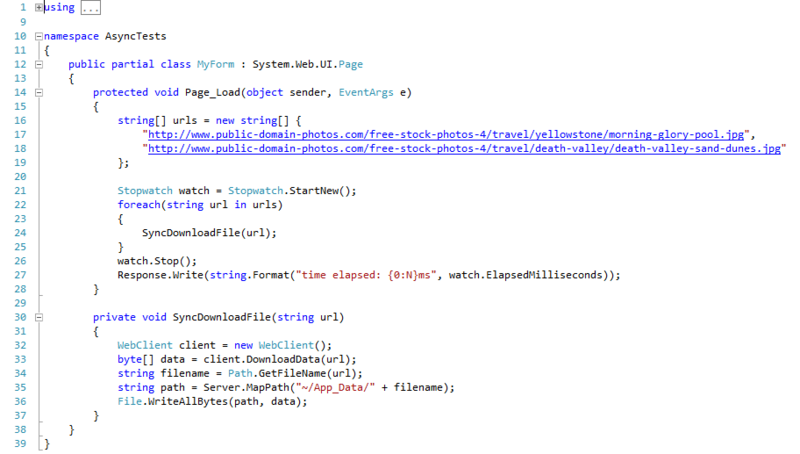 My desire is show the value in txtSync and after finish the async process show the value in txtAsync. Is this possible? I think my problem is return the thread UI. I tried synchronize the threads but SynchronizationContext don’t work in this case. If I understand correctly, in the second scenario you’re clicking the Async button (let’s relate to it as the “first click”), and while the thread is sleeping for 3 seconds, you’re clicking the sync button (“second click”), and then you receive the response only from the sync button after it has finished sleeping for a second. If I understood your scenario correctly, then this issue isn’t about synchronization at all, but about how ASP.NET works. When you click the sync button, you’re simply generating another request from the browser to the server, which doesn’t involve the async from the “first click”. Unlike WinForms, where this would have probably worked because the form is the same instance, ASP.NET doesn’t work this way: one cannot generate 2 different requests to the server and expect them to be synchronized, unless you decide to employ static methods and variables somewhere along the way, which are shared across the threads (but this won’t help you use await/async). You simply generated two requests and observe the result of the latter one. You understand correctly. Thanks for explanation. Just for curiosity: What would your solution for this case? However, this solution doesn’t require .NET’s async/await, unless you decide to employ it on the server side for achieving async there – but it is not required for performing a simple Ajax request. This sounds like the better solution in this scenario. I’ll try implement this way.